WESTMED Medical Group has installed a digital signage solution in its new comprehensive medical office at Westchester’s Ridge Hill in Yonkers, New York. WESTMED's medical office offers a variety of medical services, including primary and specialty care, radiology, medical lab, and urgent care. The digital signage project, implemented by ESSENTIALCOM and based on YCD Multimedia's digital signage platform, includes 22 HD video walls in the office’s two main 300-foot-long corridors, and on the second floor entrance check-in lobby. Content includes high-definition ambiance video clips, such as nature and landscape, pictures taken by employees and patients, and information about selected WESTMED programs and services. 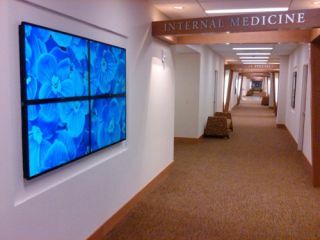 The video walls installed at the medical office consist of more than 70 Samsung thin LED displays using Key Digital HDMI extenders and running YCD's C-nario Messenger. "The video walls have improved the patient experience, creating a calm and welcoming environment in waiting rooms and corridors throughout the facility," said Simeon Schwartz, MD, president and CEO of WESTMED Medical Group. "In addition, we offer employees and patients the opportunity to provide their favorite pictures to be displayed on the video walls. We also display educational programs, seminars and lectures on new health initiatives."